The results of the 2016/2017 Speexx Exchange survey are in and they show that organizations are maturing rapidly. HR and L&D professionals in organizations of all sizes face a fast–changing learning and technology environment. They also play a key role when it comes to driving their organization towards a mature learning environment that facilitates flexibility. Download this white paper to access more exclusive insights from the Speexx survey and learn how to create a sustainable learning culture in your organization. Are organizations on the path to learning maturity? How will the promise of the “human cloud” impact learning? Is mobile learning still “buzzing” in corporate learning? Blended learning is moving into the cloud. What does this mean for HR and L&D? 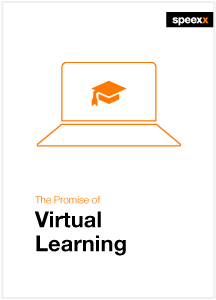 Driving virtual blended learning – 5 steps to success. Learning and development is most effective when it sits right at the heart of the business. L&D professionals are increasingly aligning themselves more closely with strategic goals and matching learning and development delivery to what business and the learners need in their day-to-day workflow. In this video, Armin Hopp, Founder and President of Speexx offers practical tips to help HR directors and managers build the right skills to support organizational strategy.